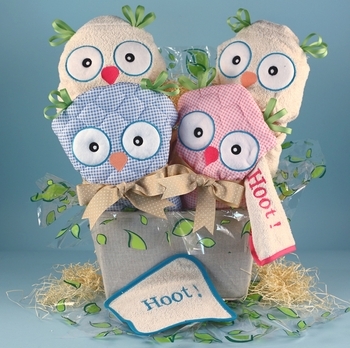 Adorable owls are the inspiration for this cute and unique baby gift basket for twin babies and each is custom made in color combinations for girls & boys! Featuring two luxurious hooded bath towels and diaper changing pads, this gift always proves to be a very wise choice. Both the towels and changing pads are beautifully embellished with owl face details making them a cute, yet practical addition to the baby twin�s collection of necessities. In addition, we add two baby washcloths and burp cloths to the fabric-lined storage box. All of these layette items are of the utmost quality and completely made in America using only the finest American cotton fabrics. They cannot even be compared to cheap imported versions! Please click on More Images above to see more photos of the bath towels and changing pads. Note: Please select twins genders when ordering. Everything arrives fully gift wrapped in opaque white tulle for a truly special presentation.